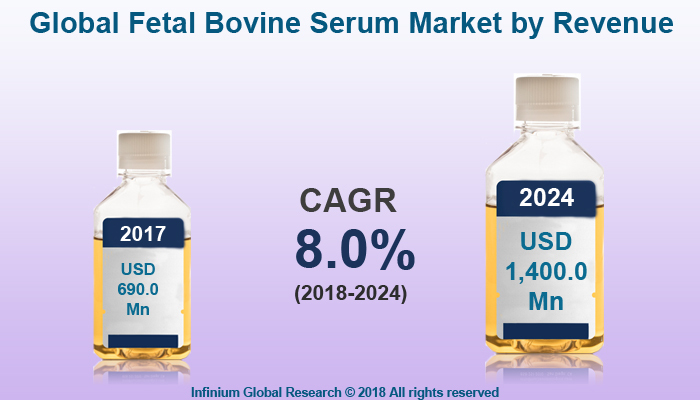 A recent report published by Infinium Global Research on fetal bovine serum market provides in depth analysis of segments and sub-segments in global as well as regional fetal bovine serum market. The study also highlights the impact of drivers, restraints and macro indicators on the global and regional fetal bovine serum market over the short term as well as long term. The report is a comprehensive presentation of trends, forecast and dollar values of global fetal bovine serum market. According to report the global fetal bovine serum market is projected to grow at a CAGR of 8.0% over the forecast period of 2018-2024. FBS is a by-product of the meat processing industry a critical raw material for much of the biotechnology, pharmaceutical and diagnostics industry. FBS is obtain from whole blood obtained from normal bovine fetuses. Fortify cell culture media is the primary application of fetal bovine serum (FBS). Fetal bovine serum is important for innovative research in drug development. FBS has wide applications in cell-based research, diagnostics, drug discovery, cell therapy, toxicity testing, in vitro fertilization, human and animal vaccine production and biopharmaceutical manufacture. Research and development efforts in the commercial and academic sectors continue to depend on fetal bovine serum as a safe and effective growth medium. Growing demand from traditional serum users is likely to boost the growth of the market. Growth in number of academic research institutes and government collaboration with the academic research institutes to support research activities are likely driving the demand for fetal bovine serum. On the other hand, due to unfavorable climatic conditions such as drought, and growing beef and dairy demand has led to an extreme drop in cattle herd population. Thus the affecting the demand of FBS. Furthermore, increasing customer’s interest in qualifying serum from several global regions, this change will provide flexibility to companies for adjusting their serum sourcing in the terms of price and availability. In terms of regions, North America is expected to be the largest market for fetal bovine serum. The high consumption and high pricing of fetal bovine serum in the region. The US being the biggest market for FBS. Growing demand, together with a lower supply has led to a volatile market for the U.S. The rapid emergence of contract research organizations particularly in India and China is a key factor driving the growth of Asia-Pacific region. Moreover, Infrastructural development and number of research organizations are outsourcing research activities to these countries for relatively low cost without negotiating on the quality of research. The report on global fetal bovine serum market covers segments such as, application type and end user. On the basis of application type the global fetal bovine serum market is categorized into drug discovery, cell culture media, in vitro fertilization, human and animal vaccine production, diagnostics and others. On the basis of end user the global fetal bovine serum market is categorized into research & academic institutes and industry. The report provides profiles of the companies in the global fetal bovine serum market such as, HiMedia Laboratories, Merck KGaA, Bovogen Biologicals Pty Ltd, Atlanta Biologicals Inc., TCS Biosciences Ltd, Tissue Culture Biologicals, Rocky Mountain Biologicals, GE Healthcare and Others. The report provides deep insights on demand forecasts, market trends and micro and macro indicators. In addition, this report provides insights on the factors that are driving and restraining the global fetal bovine serum market. Moreover, IGR-Growth Matrix analysis given in the report brings an insight on the investment areas that existing or new market players can consider. The report provides insights into the market using analytical tools such as Porter's five forces analysis and DRO analysis of fetal bovine serum market. Moreover, the study highlights current market trends and provides forecast from 2018-2024. We also have highlighted future trends in the fetal bovine serum market that will impact the demand during the forecast period. Moreover, the competitive analysis given in each regional market brings an insight on the market share of the leading players. This report will help manufacturers, suppliers and distributors of the fetal bovine serum market to understand the present and future trends in this market and formulate their strategies accordingly.